As a new blogger, my number one challenge has to been drive traffic to my blog. After all, what is you thinking if no one is going to read new blog which you just started? When you are starting off, you have no backlinks, no page rank, and no chance of showing up in the result of Google search. So how to get the readers? You can put your blog url in Facebook, Friendster, Hi5, MySpace and etc. So, your friends can visit your blog in your social networking on anytime. It is easy for your readers to bookmark your blog on the social bookmarking sites..But, it is not enough.. I suggest that you better to use Stumble Upon, Technorati, del.icoi.us, Reddit, Furl, Digg, Share This, and Propeller. You must register your own account, then submit your blogs to them. It is easy. StumbleUpon and Technorati are most popular site because they can get to know what is their rank and how many the visitors who read your blogs. 2. Comments and Blogrolls are your friends. Like a post on a popular blog, such as HongKiat and JohnChow. You can try to leave a comment on it. If your comment is nice, others might want to check out your blog. Blogrolls are simply a list of your favorite blogs that you put in your own blog. Just by doing this, some bloggers will notice that they are getting traffic from your blog and return the favor. You can also ask other bloggers to add your site to their blogroll. For example, I asked a blogger to add my blog when I added his blog in my blogrolls. 4. Join in the Online Communities or Discussion Groups. If you have forum or discussion groups, you can promote your blog.. As example, Allblogger Malaysia, Lowyat Forum, and Yahoo Groups. 5. Join the Traffic Exchange Program. For example, I just joined a site called BlogMad. I make new account...then, I submitted my blogs. It is good to promote your blogs. You can add the tags, and surfing other blog if you like to vote bad or good only..Then, I have received some decent traffic from it. .. Still, I have to put referrals links or ads for my blogs. It can make the readers curious about what it is and click on the ads to check it out! 7. Affiliate Marketing Program - You can join in the affiliate marketing sites and help to promote their ads, like Google Adsense, Widgets, TextAds, ReviewMe, and etc.. For example, you promote the adverting and selling the products. This is a great way to gain more money when you can attract the readers to see it at your blog. 8. Join MyBlogLog to be able to make contact with other MyBlogLog users and develop relationships in your community. Then you can put a widget reader in your blog. Do u know how to promote your blog? It can work out for your blog? Please share them with us by leaving a comment! Hmm, well to each his own. I began my Blog for my own benefit, I never thought of attracting "traffic". 'Tell you the truth, Internet traffic is a little scary and if they never heard of me, that is fine. Three words - Content, Content, Content. "Ya gotta give the people what they want"
Is there any "juicy red meats" (sic) left? I think everyone has pretty much made hash out of anything worth reading. These days it is even difficult to think up a new blog post! 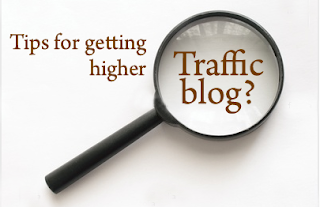 Blog traffic?? Ye Gods! Maybe I will make a new header, reading,"Stay Out". (OR): Enter at your own risk? ?